I wasn’t much interested in alternative history as a genre (subgenre?) until I read Kim Newman’s Anno Dracula a few years ago. The mixing of historical personages with an array of fictional characters from the vast stretches of vampire literature, including those from Bram Stoker’s influential and most famous novel -- was clever, the plotting deft, the writing and characterizations, the mix of personalities were all spot on. There might be something to this alternative history thing, I thought. I still haven’t read widely or deeply in this particular subgenre, but it seems to have caught my attention recently. 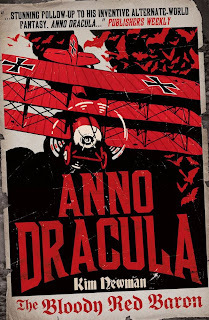 I’ve been entertained by two alternative versions of The Great War simultaneously: I’ve been reading Newman’s follow up to Anno Dracula, The Bloody Red Baron, while listening in my car to the audiobook version of Scott Westerfeld’s Leviathan and Behemoth. The latter two novels -- parts one and two of a proposed trilogy -- are essentially entries in the steampunk arena, in which I’ve read and enjoyed stories by James Blaylock, Kage Baker, and others. Westerfeld’s tales about a lost heir to the Prussian Empire are entertaining and interesting. But I’m here to examine Newman’s novel. I don’t typically stray into the horror field in this venue, but there is plenty in this book to entertain pulp fans. First off, the setting is World War I, the global conflict against which innumerable air war magazines and characters based their pulp-paper existences. Second, alongside the literary vampires -- Lord Ruthven, Count Dracula -- and the historical folks -- Churchill, Edgar Allan Poe (who happens to play a particularly interesting role in the narrative), the eponymous Manfred von Richthofen, British ace Albert Ball, German novelist H.H. Ewers -- are plenty of recognizable pulp magazine characters, and characters of interest to pulp fans, such as Conan Doyle’s Mycroft Holmes, Jules Verne’s Robur, and H.G. Wells’ Dr. Moreau. In Chapter One, we’re introduced to a number of fliers tied to Allied Intelligence, among them Kent Allard (who, after the war, would be better known to pulp fans as The Shadow), Bigglesworth, and Jim “Red” Albright (better known to OTR and comic book fans as Captain Midnight, traditionally associated with WW2). But this isn’t a peripatetic tale of strung-together cameos, like an episode of Laugh-In featuring TV and movie stars poking their faces out of a surprise window to spout a punch line. Newman’s novel is bold, fierce, and frightening. 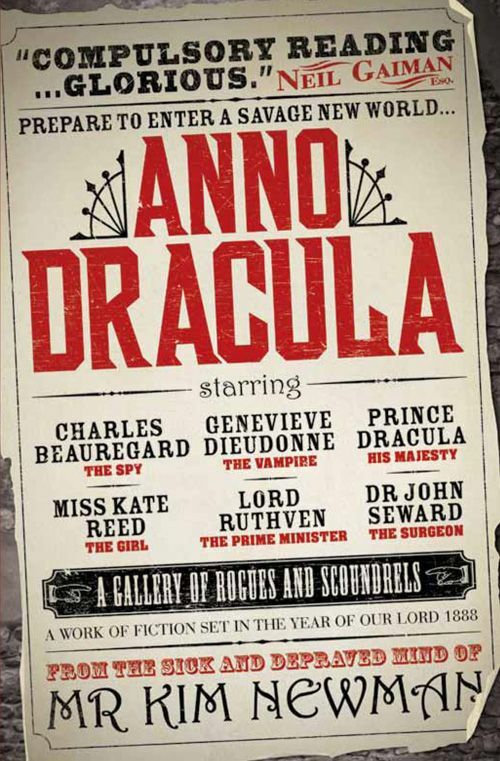 Anno Dracula waded through Victorian gothic trappings dripping with gore. The Bloody Red Baron is about nationalistic pride, the ego of nations, the muddy and bloody horror of arrogant generals running a war in which the soldiers and their strategies haven’t quite caught up to the advances in the technologies of death. The destruction of civilization appears to be the focus of the warring minds here, particularly as epitomized in Count Dracula. Newman’s Dracula is remarkably repugnant here -- this is no soft-focus romantic lead in the Frank Langella mode. Even Stoker’s Dracula is less frightening. Newman showed us Dracula from a distance in Anno Dracula. But here, he finally seems to have grasped the majestic evil of the character. As Richthofen says, “He is a huge person. He has his own gravity. There is a mental pull, an invisible fist. . . . To be in his presence is like being buffeted by strong winds which threaten to tear one’s mind to fragments. This is not even his intention, it is what he is.” This is the 20th Century man encountering the alien psychology of the medieval barbarian warrior-prince, whose understanding of Total War is as incomprehensible to us as our own world’s Technological War would be impossible to comprehend by the historical Vlad Tepes. Newman ably demonstrates his considerable mastery of storytelling in this novel. 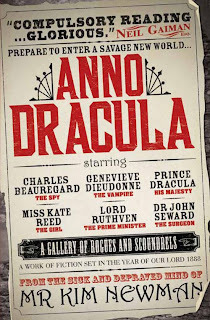 It’s newly available in an edition from Titan Books designed to tie it with its associated novels -- Anno Dracula, Dracula Cha ChaCha, Jago, Johnny Alucard, and so forth. Recommended. Arthur Conan Doyle’s most famous creation will outlive us all. Certainly Holmes had a great influence on some of the well-known pulp heroes -- The Shadow, Doc Savage, G-8 and Captain Philip Strange are obvious examples -- and continues to exert his personality and quirks on contemporary characters in a variety of media, such as August Derleth’s Solar Pons, Preston & Child’s Agent Pendergast, Hugh Laurie’s Dr. House, my own Shalimar Bang, and of course Robert Downey Jr’s Holmes, Benedict Cumberbatch’s Sherlock, and Jonny Lee Miller’s Elementary. I’m not a Holmes completest, but I have a set of the stories I dip into from time to time. I prefer the volumes published by Oxford University Press, for their introductions and annotations by Richard Lancelyn Green and Owen Dudley Edwards, W.W. Robson, and Christopher Roden. I also have a copy of Volume 2 of William S. Baring-Gould’s Annotated Sherlock Holmes. (Someday I’ll grab Volume 1.) And I’ve been entertained by Leslie Klinger’s new Annotated Sherlock Holmes volumes. It’s good to have a solid collection of the Holmes canon on hand when the mood strikes. The number of publications devoted to Holmesian scholarship may outstrip that of literary scholars engaged in academic pursuits. (That’s a guess on my part, not a deduction based on any real investigations.) But just as one might suppose that no new topic on Shakespeare or his plays or poems could possibly find its way into a dissertation from one of the world’s graduate schools, new Shakespearean investigations continue to arise, improbably. In the same vein, studies on some facet of the Holmes stories continue to appear. An interesting one that recently arrived from -- suitably enough for me -- Oxford University Press is The Scientific Sherlock Holmes: Cracking the Case with Science and Forensics by James O’Brien. True Holmes completists will likely have in other books or papers a lot of the information O’Brien offers. For instance, there are brief sections describing Holmes, Watson, Moriarty, and other important characters; a profile of Doyle, plus chapters that illustrate the influences of Edgar Allan Poe and Dr. Joseph Bell upon Holmes. But for the interested reader, the semi-casual scholar, or the curious pop-culture fan, it’s nice to have some of this info gathered within the covers of a single slim volume. For example, O’Brien offers an area of forensic science applied by Holmes -- such as fingerprints, footprints, handwriting analysis, and cryptography -- and accompanying descriptions of how each is used within specific stories. O’Brien also includes examples of how those techniques have been applied in solving famous, real-world crimes, such as the Lindbergh kidnapping, the Zodiac murders, and so forth. O’Brien also gives space to Holmes’ dabbling in mathematics, physics, biology, and other sciences, but the heart of the book is its examination of the world’s foremost consulting detective as chemist. O’Brien’s particular expertise comes into play in this section. (Poisons are such fascinating tools.) Besides exhibiting some basic mixology skills applied at cocktail time, I’m not a chemistry expert by anyone’s standards. But O’Brien’s explanations are readable and engaging, and even a layman can gather some interesting information from his discussion. O’Brien’s examination of Holmes’ scientific methods may not suit every reader of the canon, but for those who have a deeper-than-mere-passing interest in the habits of that eventual beekeeper from Baker Street -- or simply a curiosity about how today’s fascination with CSI-style forensics may have played out at the end of the 19th Century -- this book will provide several hours of engaging reading. Recommended. You can find O’Brien’s book on Holmes at Amazon by clicking here. The Oxford University Press Sherlock Holmes volumes . . .